I consider myself more of a fan of historical gaming rather than fantasy, for the most part. 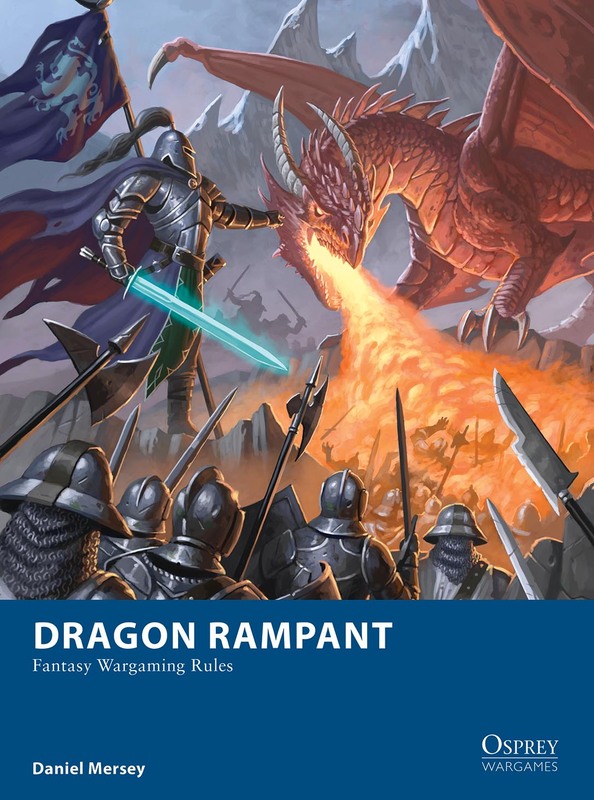 But, having been a fan of Dan Mersey’s Dux Bellorum and Lion Rampant rules, I just had to get a copy of Dragon Rampant as well. Of course, I had to build an army to go along with it. I wanted to get an army that would be compatible with my existing Early Dark Age army in terms of basing as well as period “feel”. This would not be easy as most fantasy figures look like they belong in a later period, such as medieval or later Dark Age, i.e., after the Vikings show up. I settled on an Undead army to start with because I figured that I could go with zombie for the bulk of the warband and blend in a few period-specific elements like shields and helmets. We’ll see how the zombies turn out in a later post, but for now, here are a couple of my first units. The first up is a unit of “Vengeful Spirits”. For those of you following along with your Dragon Rampant rule books, these guys are Elite Foot with the added attribute of Fear. 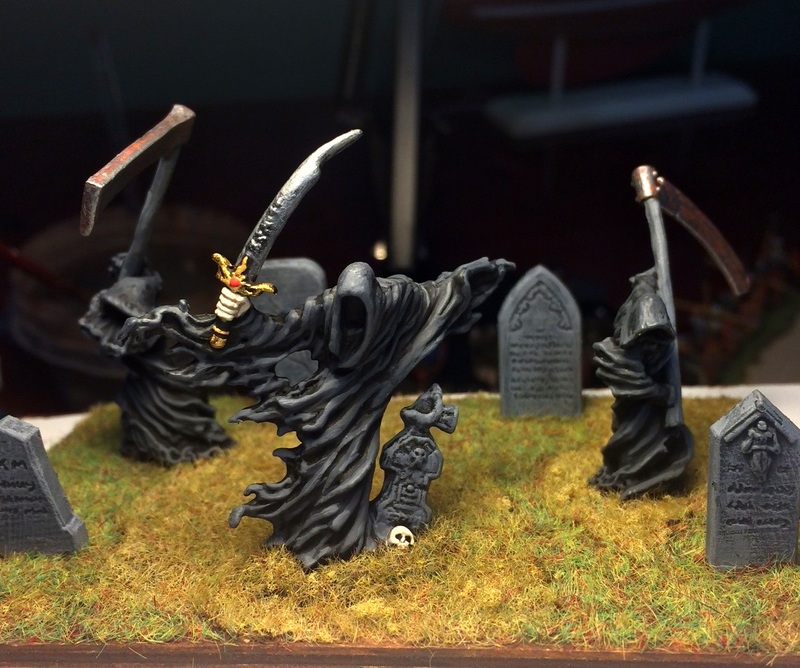 The spirit at front and center is a Reaper Bones figure and the two others are metal Reaper figures, while the gravestones are from Renendra. I debated whether to base them individually or on a multi-figure base, but decided on the latter. It fits with the basing scheme I’ve been using with my other Dark Age stuff, and I really like the freedom to create mini-dioramas that the larger bases give me. Obviously, this is what the rule book calls a “reduced model unit”, since there are only three of them, but I think a unit of ghosts looks better with fewer figures. 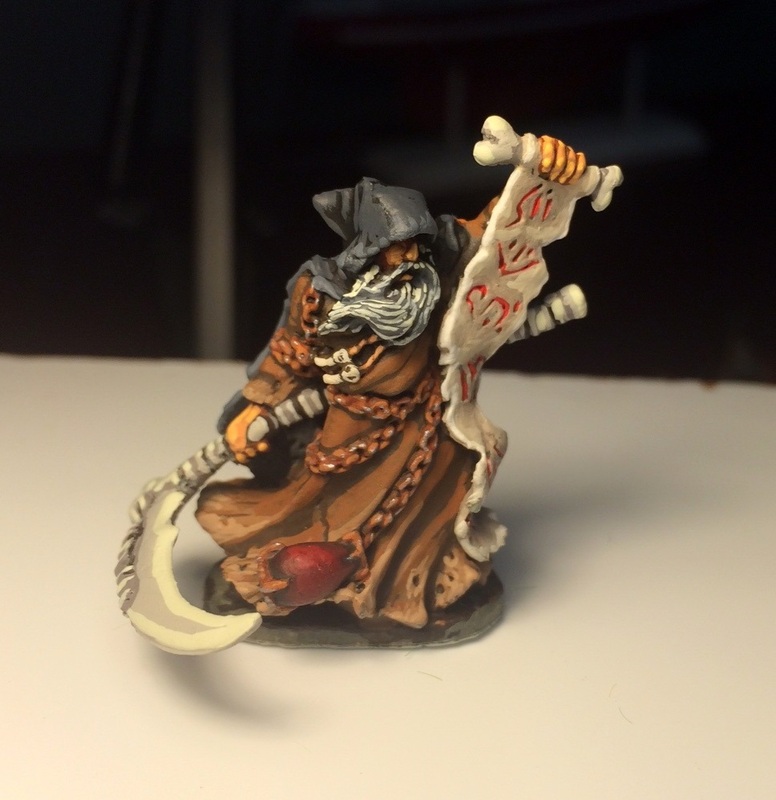 Next up is my Necromancer, although he still needs to be based. He, too, is a Reaper Bones figure. 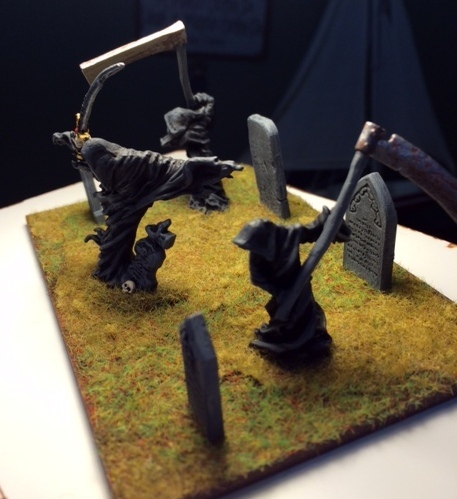 If you’ve never painted any of the Reaper Bones figures, it takes a little getting used to because they are soft, bendy plastic. But the detail is good and they take the paint well, so I’m hoping that the material translates into more durability on the tabletop. 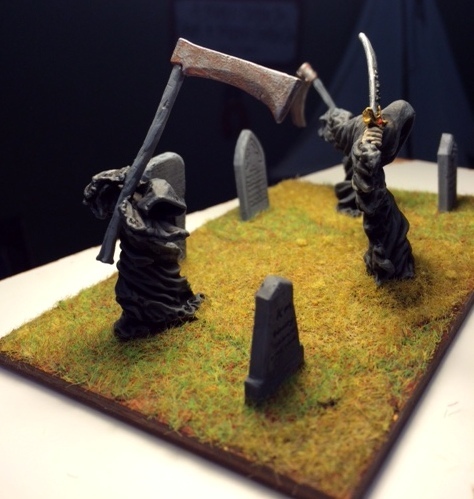 For his base, I’m planning a somewhat largish vignette showing him raising an undead thrall from the grave. I’ll post a photo of it when I’m done. For the rest of the army, I’ve bought a big pile of Mantic plastic zombies and I’m currently in the process of mixing them with some Gripping Beast plastic parts as well as a few metal figures here and there. My goal is to make it look like it includes dead men from all four of my current armies: Roman, Sub-Roman British, Saxon and Pict. Fortunately, the Mantic zombies come with extra heads which will add a little uniformity to the whole mob. We’ll see how well it turns out, and I’ll post pictures of that when it’s ready.